If you take a ride on a new Washington State Ferry, it’s likely your vessel’s onboard power is provided by three Volvo Penta generators from Pacific Power Group. Volvo Penta diesel generators have been selected to power two new ferries for the Washington State fleet, including the Chimacum, which was recently delivered, and the Suquamish, currently under construction. area – from Port Defiance all the way to Vancouver Island in Canada. Seven of 22 current vessels are between 40 and 60 years old and are approaching the end of their service lives. The new Washington State vessels are the Olympic class 144-car ferries, two of which are already in service. Vigor Industrial was contracted to build the new ferries, with PPG providing the crucial onboard power. The Chimacum will be replacing an older vessel on the Seattle/Bremerton route in late spring 2017. The Suquamish is slated to arrive to WSF in Fall 2018. 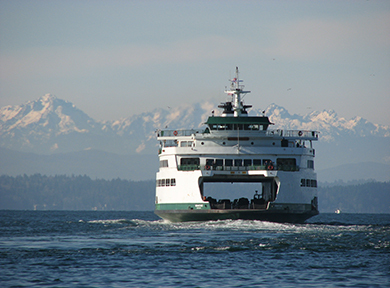 Two additional ferries built by Vigor have already joined the WSF fleet: the Tokitae joined the Mukilteo/Clinton route in 2014, and the Samish was put into service on the Anacortes/San Juan Islands route in June 2015. Reducing emissions is a critical focus for WSF. The new Volvo Penta generators are EPA Tier 3-certified and will have cleaner operations than previous power sources, helping to reduce impact on Washington’s waterways and air. 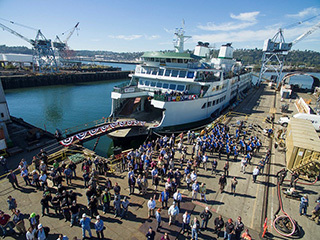 Our marine team is supplying four diesel generator sets for a new Olympic-class ferry named the Suquamish that is currently under construction for Washington State Ferries. Three Volvo Penta D13 keel-cooled ship service generators each will supply 341 kWe of power to the ferry. Our team also supplied a Volvo Penta D13 radiator-cooled emergency generator set rated at 365 kWe. The engine packages are EPA Tier 3 commercial emissions certified, making them environmentally-friendly, and are assembled on a custom-fabricated steel skid made by our Kent Marine team. The work of our Marine team will be vital to the ferry’s operation as it provides transportation throughout the Puget Sound area. The Suquamish is currently under construction at Vigor Industrial’s Seattle shipyard. 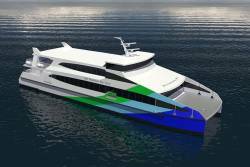 The new ferry is being built as part of a program to replace four of the state’s ferries that are more than 50 years old. Delivery for the project is planned for mid-2018.